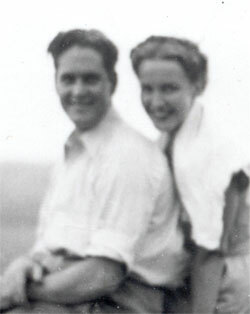 Walter says he met Kathleen at a bar in Castlewood during Labor Day weekend, 1942. It was wartime. Her brother had been killed four months earlier. Walter, known as Curly, was about to report for duty. Curly was impressed with the blond beauty but he couldn't stick around. Seventeen months later he was a radio sergeant in the Air Force, stationed in Tennessee. He was suddenly given a short weekend pass and hitched up to St. Louis with 35 cents in in pocket. He got home and there was no one there to lend him a dime. He went to the corner store. No one there either. He got himself to the Corkscrew and found someone happy to give a soldier money for drinks. He asked around about Kathleen and was told she was engaged. More drinks. Meanwhile, Kathleen was far from engaged. While Curly was at the Corkscrew, she was at a party being held in her mother's basement for a returning serviceman, related to her friend from grade school, Lorraine Cronin. Lorraine was going with Jack, Curly's brother. Being wartime, of course, there were few men at the party. So Kathleen goaded Lorraine and Jack into taking her to the Corkscrew to bring back some guys. Off they drove. And, to everyone's surprise, there was Jack's brother. You'd think there would be violins playing when Curly saw Kathleen again. But by that time, all the single girls at the Corkscrew had been buying Curly drinks. Jack dragged him into the car. He turned to Kathleen. "Are you Betty Letty?" he asked. But a guy was a guy, so they brought him back to the party. Quickly, another girl cornered Curly for a dance. Hold on a minute, Kathleen thought. I was the one who went to the trouble of going out and getting him! She took the bold move of cutting in. The Betty Letty faux pas was history. My father was instantly in love. When the evening ended, he walked her up the back stairs and gave her a little kiss. He wanted to linger but the evil dog Ming growled at him, so he had to be a gentleman and be on his way. They were married on June 14, 1947. Today they are celebrating their 57th anniversary. Kathleen's family owned a machine that burned records. For better or for worse, Kathleen and Curly started out their lives together trying to record some songs. It's no surprise that the endeavor started with an argument. (Kathleen has always been the techie of the couple).